This illustration was especially done for an anonymous friend of mine, who is starting a new uncensored blog called Nomadette. Nomadette is a personal journal of a very opinionated and well traveled girl, who is not afraid to tell us exactly how it is. The blog will be up and running very soon, and I am looking forward to reading it. Here, as always, Nomadette is traveling in style. She is wearing a beautiful brand new dress from the Emma Cook SS 2010 collection (check out look 22). She layers it with a shaggy woolen gray Miu Miu cardigan with a fringe all over. To keep her warm in the coldest of places, Nomadette is wearing a gray wool and cashmere hat from Aubin & Wills. Layered jewelery is a must, and she is mixing local finds with her favourite red ribbon & pearls Lanvin necklace. 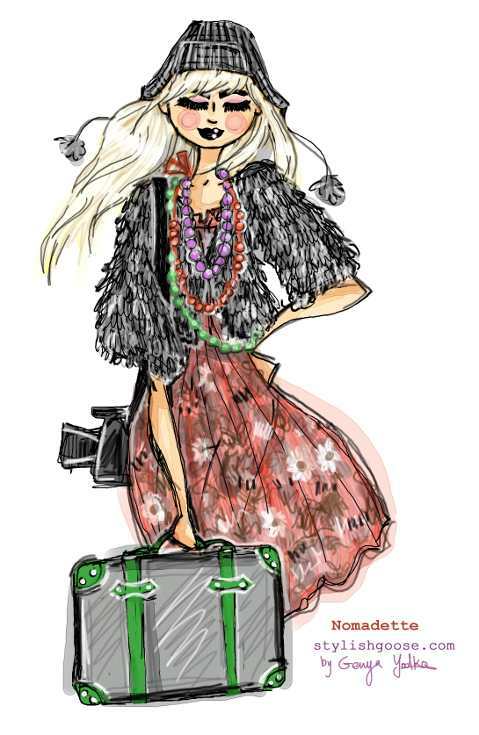 Her limited edition Globe-Trotter suitcase is filled with travel basics (and just a few stylish indulgences). And of course Nomadette will never forget to grab her trusty Nikon camera, so she can share her adventures with us! I was stopped in my tracks when I first saw this photo of Anna from Sweden, captured in London by Wayne Tippets. She has a sweet angelic beauty, and looks romantic and mysterious in this photograph. I love the light and shadow in the photo, which emphasize the vivid colours of the floral shirt. Anna's divine and slightly dark look reminded me of a J.W. Waterhouse painting, transposed to our time. Angela is a beautiful edgy redhead, who is a successful stylist and fashion journalist from Dublin. I have already illustrated Angela before as part of my choice for Grazia Style Hunter Awards, where I fell in love with her modern and easy sense of style. This is another illustration of Angela, drawn from a reference picture she sent me. 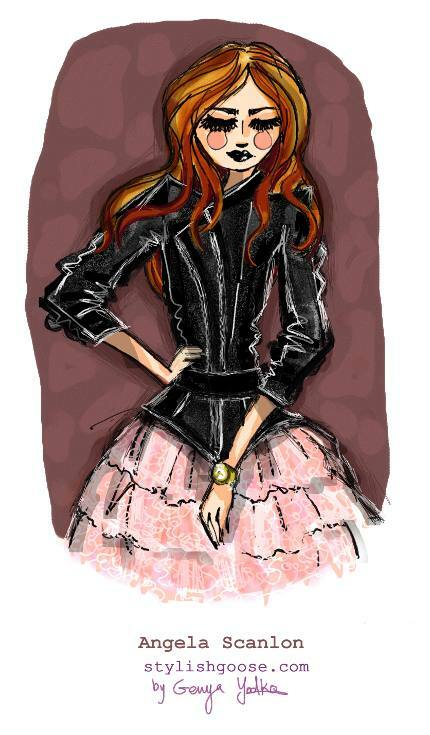 I like the contrast between the biker leather jacket and the pink ballerina skirt. Here is a photo from the same shoot. Isn't she just rocking? Yesterday I posted the illustration I did from Ottawa's Fashion Cures a la Mode - a fundraiser for ovarian cancer that featured fashion shows from local Canadian designers. Here are some more of my favorite looks from Eugenia Leavitt's collection. The first look is a white shirt with fabric petals around the collar, paired with a silky black skirt (which I love!). The second look is a bright red dress with corset-like top covered in petals. A cure little cocktail dress that looks like a beautiful flower! Last week we finally had some fashion excitement here in Ottawa! A four day fashion fundraiser was held to promote local Canadian designers and collect money for ovarian cancer - it was called Fashion Cures a la Mode. Unfortunately I was sick for the first two days, but was lucky to make it to the rest of the event as I got to see the Eugenia Designs show! The talented Eugenia Leavitt is the designer behind this Montreal based brand. I have been admiring Eugenia's collections for the past few seasons, and was really excited to see her fall 2009 collection up close. Eugenia's aesthetics are simple and modern silhouettes, vivid colours combined with soft neutrals, and little pretty details that make the look unique - in the past it was rosettes, then pleats - and now it is fabric petals. How cute! Bellow are just two of the looks, but more will come later. The first look is a black strapless jumpsuit, worn with a white silk shoulder-band that has petal detail on the upper back. The second look is a draped black camisole, with a silk pencil skirt that has pockets and petal detail on the front. Those two looks (and the entire collection) are classic, but also lighthearted and playful. Combined with the show's hair & makeup, it reminded me of Breakfast at Tiffany's. 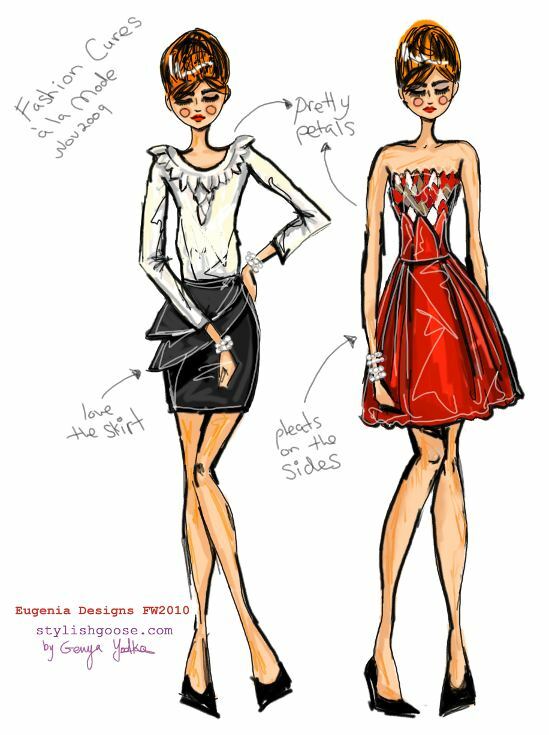 So in my illustration, I paired those elegant looks with piles and piles of Tiffany signature double-strand bracelets. Hello My Dears! I missed you all! This poor illustration was sitting around, two thirds finished, for 4 days... But more on that later. 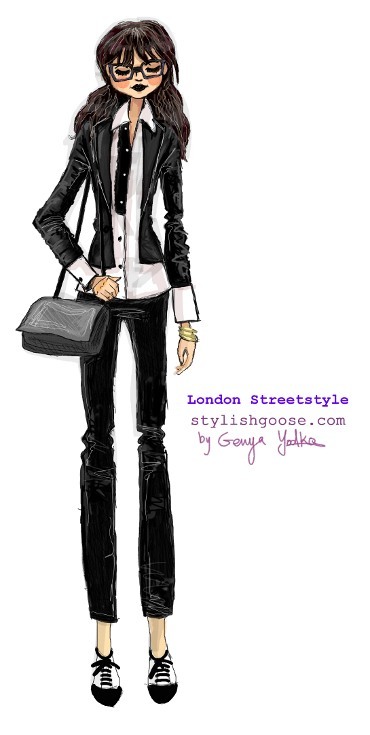 Let me introduce my choice for London in the Grazia Style Hunter Awards. This is the adorable Neha. I love her take on the tuxedo dressing so much. It is dark, quirky, sweet and nerdy all at the same time. The well fitted jacket and cropped pants are great versatile items, and Neha personalizes them with cute prep-school booties and over-sized geek glasses. Neha is wearing her look with so much ease, comfort and confidence, that there is no hint of "playing dress-up" involved. For that, Neha got my vote! Stylish Goose had its vote, and I hope you did too. Had such a great time illustrating the lovely UK and Ireland ladies. Now looking forward to the official results on November 17th. Now begin the excuses ;)... So I was bedridden for the past 3 days with very high fever and the worst case of sore throat I've had yet. No, not the swine flu! But for a while I almost believed that I had it. When I went to the doctor's I overheard the nurse saying: "A serious flu case, possibly h1n1". But all is well, and it was cleverly diagnosed by my doctor as strep throat (with his convenient little strep diagnosis kit)! Yay for doctors. Getting better now. 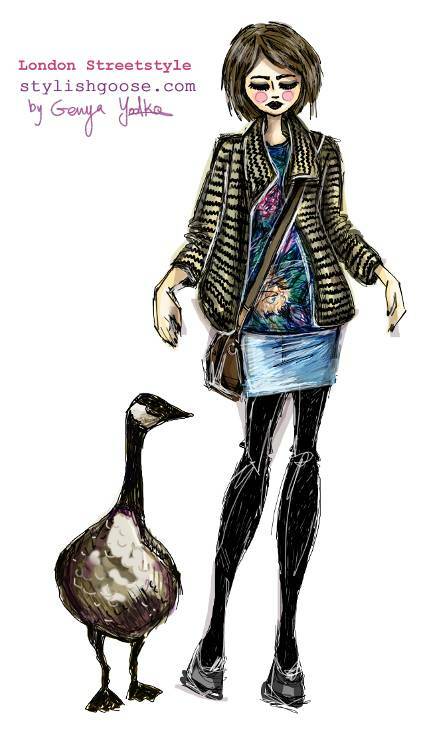 Stylish Goose is in Independent.ie!!! Do you remember Angela? The striking redhead with an effortless style from Dublin, Ireland? I was pleasantly surprised when I found a note in my mailbox this morning from her. 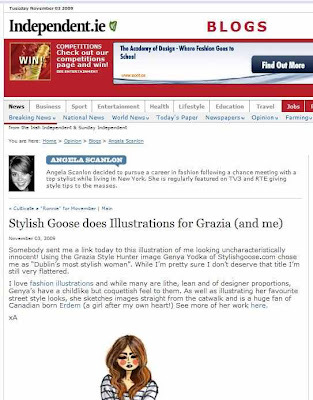 Angela is a stylist and a fashion journalist for the Irish Independent newspaper, and she wrote a nice story featuring my illustration of her from the Grazia Street Style Awards. Check it out here! Thanks Angela, I love it. This drop dead gorgeous girl is Vasare from Belfast. She seems so delicate and perfect like a porcelain doll. Her vintage vest looks very folk Baltic and is totally modern when paired with a simple black tunic dress. The soft pink hat completes this sweet look. The votes end very soon, but you can still select your favourite Belfast beauty here. Come back and see the last illustrated selection from London tomorrow!! Sometimes simplicity can make a huge impact, like here for the gorgeous Angela from Dublin. She is just perfect, head to toe, and it does not seem like she`s even trying. A simple striped t-shirt and faded skinny jeans make Angela look cool and effortless, while the glam gold bag and the black booties make this look totally chic. All the Dublin ladies can be seen here. Come back for more as I am moving on to illustrate Belfast`s most stylish woman, which also happens to be my favorite look in Ireland!! This is the elegant and the sophisticated Julie from Bristol. She caries herself with so much class and style that I had to illustrate her as my choice for the Grazia Street Hunter Awards. I love her graceful and alluring style. She dresses simply, but the quality and taste speak for themselves. Here are the other beautiful girls of Bristol, which deserve the votes! Only a few more cities left. Dublin (a city that I adore!) is next.